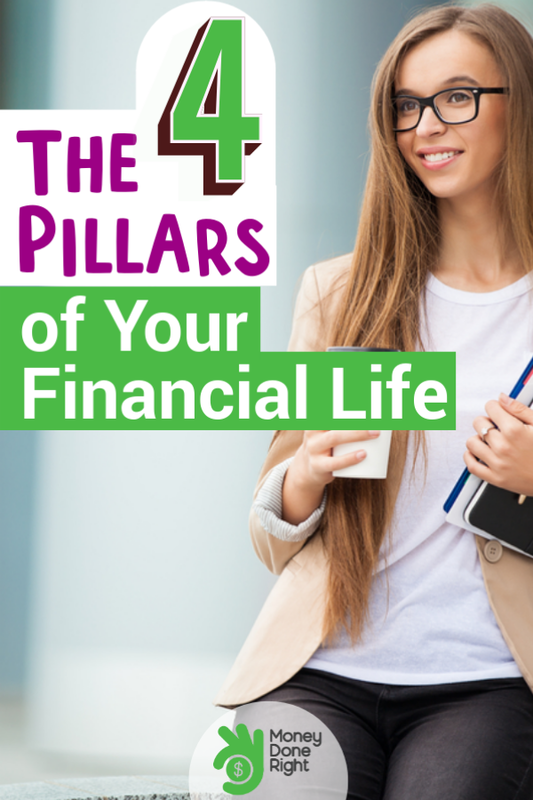 Today we are going to talk about The Four Pillars of Your Financial Life. 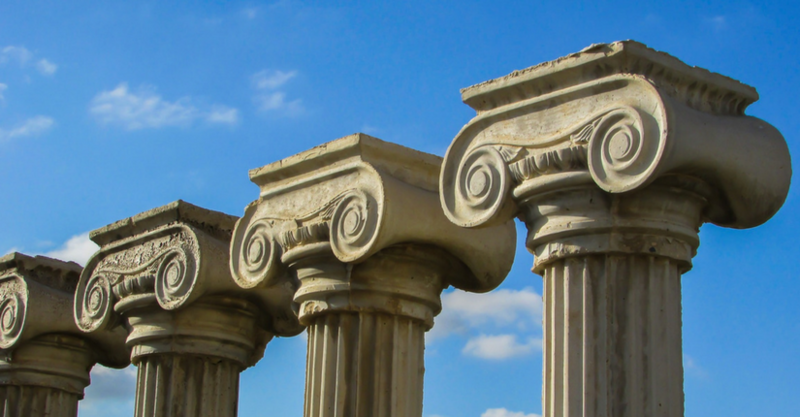 These are the pillars that we build, year after year and decade after decade, and it’s important to see every financial action we take as building toward one, some, or all of these pillars.
? Pillar 1: Pay off massive debt. This is the foundation of your financial future. You won’t be able to build any of the other pillars if you remain in bad, high-interest rate debt. For many young people, the most significant debt they have is student loan debt, so we devote a lot of material to that topic. We also discuss so-called “good” debt like mortgages on primary residences and rental properties as well as “bad” debt like credit card debt. We will also be discussing maximizing your income and cutting your expenses (along with budgeting) in order to put as much money as you can toward paying off bad debt. This may sound like a chore, but it’s actually really fun once you start seeing your income going up and your debt going down.
? Pillar 2: Build massive wealth. Once you’ve gotten a handle on your debt, you can start getting serious putting as much money as you can into savings and investments. This pillar is really fun too because there are so many interesting wealth-building assets that you can invest it. Here at Money Done Right, we invest in all kinds of assets, but the ones that we invest in the most are cash, stocks, and real estate, so we tend to write about these the most.
? Pillar 3: Give massive gifts. Despite the emoji, I’m actually not talking about birthday presents here. I’m talking about gifts that will make a significant impact in other people’s lives. These are things like funding children’s college educations and giving to reputable charities. Your wealth should not be exhausted in your lifetime! Wealth is meant to be generational, meaning that we Baby Boomers, Gen X’ers, Millennials, and Post-Millennials should work hard build to wealth not only so that we can enjoy it, but also so that those who come after us can enjoy it as well. Oftentimes this will involve leaving a significant amount of money to your children or to a reputable foundation. Oftentimes this is accomplished through wills and trusts, including trusts designed to leave a large amount of money to charity the right way. We are primarily focusing on paying off massive debt and getting started on building massive wealth. This is where most Millennials and Post-Millennials are at. We should have paid off most of the massive debt we accumulated earlier in life, and building massive wealth should be in full swing as by this point we should have hit our stride in our career and other income-generating activities. This is where most Gen X’ers are at. We’re still working on building massive wealth but prioritizing giving massive gifts more, perhaps by donating to worthy causes or funding our children’s college educations. This is where most younger Baby Boomers are at. By this point in our financial lives, we have built our wealth, and as it continues to grow, our ability to give massive gifts grows with it, and our perspective on wealth focuses more on leaving a massive legacy. This is where most older Baby Boomers are at. Are you ready to take the first step? Don’t worry about the financial mistakes you’ve made over the years. We’ve all made them. I know I did! But here’s the thing: no matter where you’re at, you have so much time left to build your pillars. With advances in medicine going the way they’re going, some of you reading this right now will live to be 100! So don’t worry. You have many more years of financial responsibility and wealth building ahead of you, and all you have to do is take the first step. If you’re confused as to where you can begin, I suggest you read my article Dear Millennials: Here’s Your 25-Step Financial To-Do List. Yes, this article is geared toward my generations, the Millennials, but it’s truly applicable to anybody! Enjoy! Thanks for sharing. There’s more than one road to Dublin =) My preferred route is equities, and the expenditure of personal capital while I still have the strength. Both the wife and I are relatively early on in our respective careers. Thanks for your input. Good to hear from other young people on the path. ?